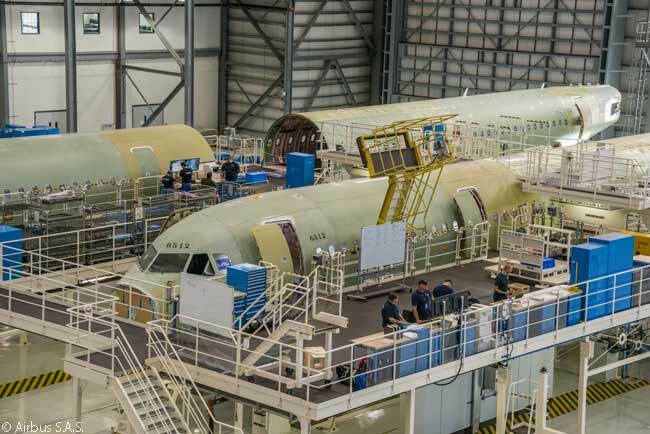 Asked by www.AirlinesAndDestinations.com if any of the aircraft assembled on the Mobile final assembly line (FAL) would be delivered to any A320-family operators in Mexico or Latin America, where Airbus has large A320-family customer bases, Brégier said they would not. Nor would any Mobile-assembled jets go to customers elsewhere in the world. “The market here [in the U.S. market] is close to 5,000 aircraft over the next 20 years,” said Brégier, speaking at a press conference in Mobile on September 13, hours before Airbus officially inaugurated its new line. Airbus’ new Mobile line, which is its first commercial-aircraft production facility in the United States, is officially called the Airbus U.S. Manufacturing Facility; it joins a variety of other Airbus and Airbus Group offices and manufacturing facilities throughout the U.S.
Airbus’ latest market forecast predicts that the U.S. market will require 4,700 new single-aisle commercial jets in the A320-family size class over the next 20 years, for replacement and market growth. The manufacturer expects the U.S. domestic market to grow at an average annual rate of 2.4 per cent over the 20 years, almost all of the growth being organic. While a variety of manufacturers will build these 4,700 aircraft, Airbus reckons it will sell more than 100 A320-family jets each year on average throughout the next two decades, according to Brégier. Accordingly, the company expects the U.S. market to “swallow” the Mobile FAL’s entire production throughout that time, Brégier added. Airbus’ latest Global Market Forecast, for the 2015-2034 period, also predicts most of the growth in the U.S. passenger market will come on existing routes. So U.S. airlines will need larger aircraft, in Airbus’ view – a view already being corroborated by the first 50 aircraft scheduled to be assembled on the Mobile FAL. When Airbus first announced in July 2012 that it would build a final-assembly line in the U.S. for A320-family jets, the company thought most of them would be A320s. However, since then the picture has changed and all but one of the first 50 aircraft which will roll off the Mobile line will be A321s. 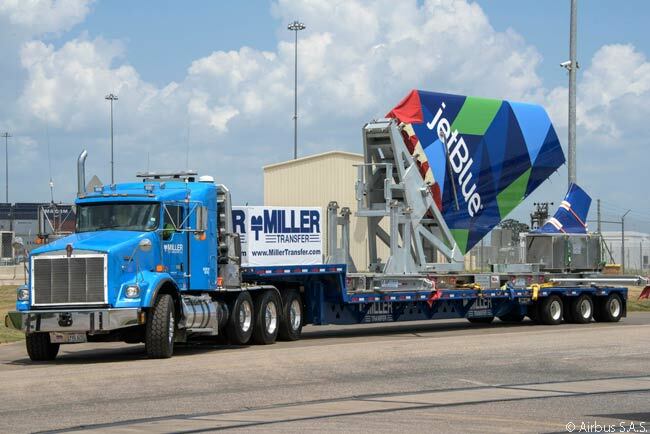 These include the first two aircraft due off the assembly line, which will be for JetBlue Airways and American Airlines and are scheduled for delivery in the second quarter of 2016. Asked if A321s would constitute 50 per cent of total Mobile production over the years, Brégier replied that in his view it would be “far more” than that. Several of the U.S. customers for A320-family current engine option (ceo) and A320-family new engine option (neo) aircraft have large outstanding orders for A321s and A321 neos. Airbus currently has a 116-acre site at the Mobile Aeroplex at Brookley, an aviation and aerospace industrial complex located on the site of the former Brookley Air Force Base, which closed in 1969. The Aeroplex at Brookley is not at the site of Mobile Regional Airport, to and from which all commercial passenger flights serving Mobile operate and which has an 8,502-foot runway. 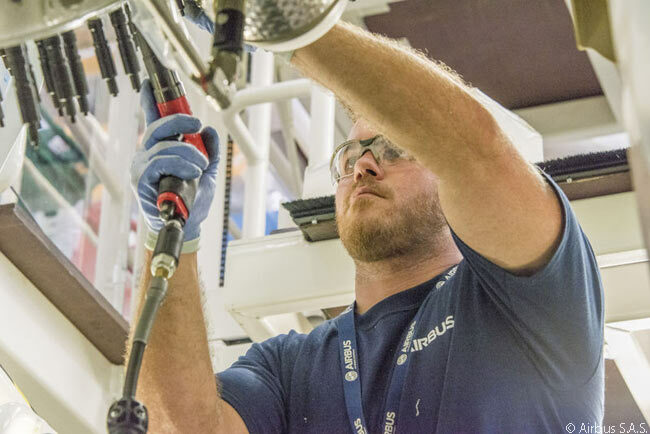 One reason Airbus chose Brookley as the location for its new FAL is that the site is far closer to Mobile’s central business district than the city’s commercial airport, which is about 40 minutes’ drive northwest of downtown Mobile. However, the Mobile Aeroplex at Brookley is just three nautical miles (3.5 miles) from the city’s business district. 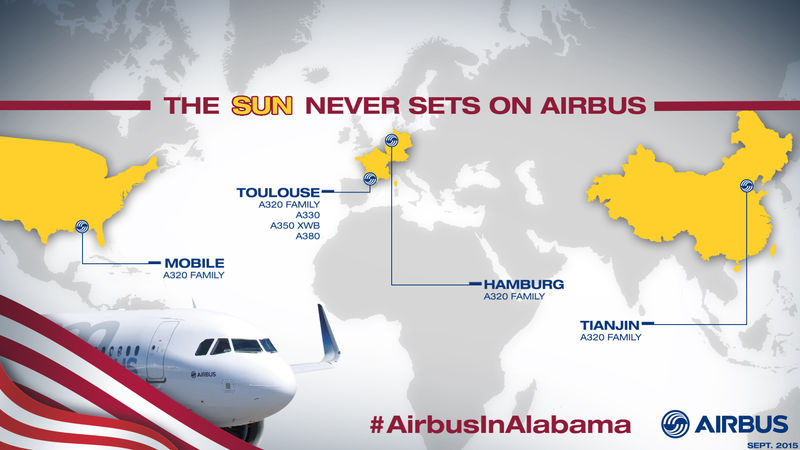 It is the same distance from Mobile’s huge seaport, to which Airbus A320-family major assemblies such as fuselage sections will be brought from Europe on ships. Then, after being offloaded, the assemblies will be trucked to Brookley within an hour. Brookley has another major advantage over Mobile Regional Airport. The longer of its two runways is 9,618 feet and so can accommodate flights by large widebody aircraft. The Brookley site contains Mobile Downtown Airport and FedEx Express operates several cargo flights daily to and from there with aircraft such as Airbus A300-600Fs and Boeing 767-300Fs. At Brookley, also, VT MAE (VT Mobile Aerospace Engineering, an aircraft maintenance and engineering firm which is another major tenant of the Brookley aerospace industrial complex) is performing freighter conversions for FedEx Express on a sizable number of Boeing 757 former passenger jets which FedEx bought from United Airlines. 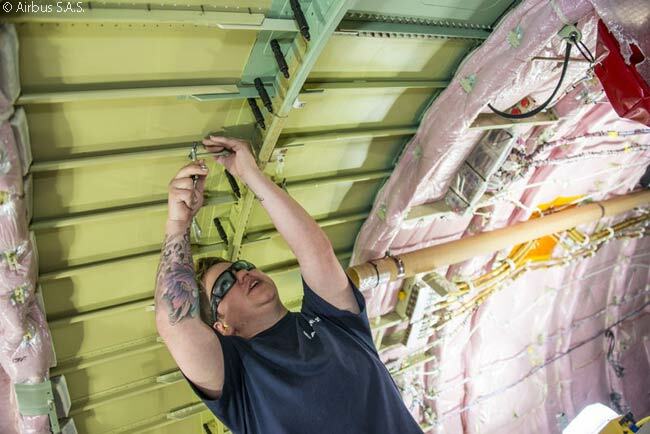 The large assembly-line hangars Airbus has constructed (at a cost of $600 million) on its current 116-acre site at Brookley are capable of producing a maximum of 50 A320-family jets a year, at an eventual rate of a little over four in a calendar month. Because the Mobile site is still staffing up to its eventual complement of 1,000 employees of Airbus and the four subcontractors Airbus is using for some production tasks (power-generation, aircraft painting and engine installation are three of them), and because training is involved, the manufacturer doesn’t expect to achieve its planned four-a-month assembly rate until late 2017. 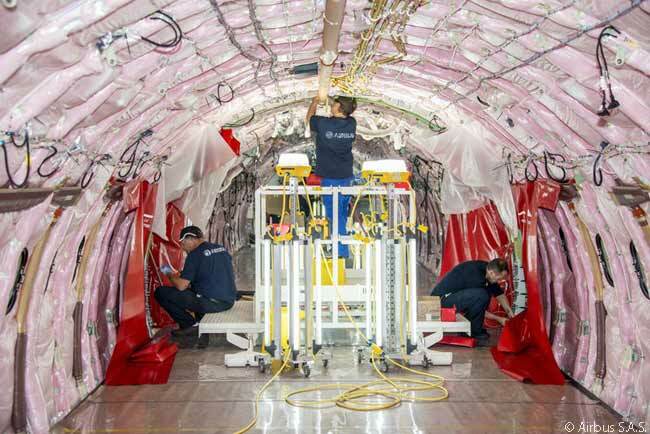 At about the same time, perhaps a month of two later, Airbus will switch its Mobile assembly from A320ceo-family aircraft to A320neo-family jets, according to Timo Zaremba, manager of production quality for Airbus Mobile. 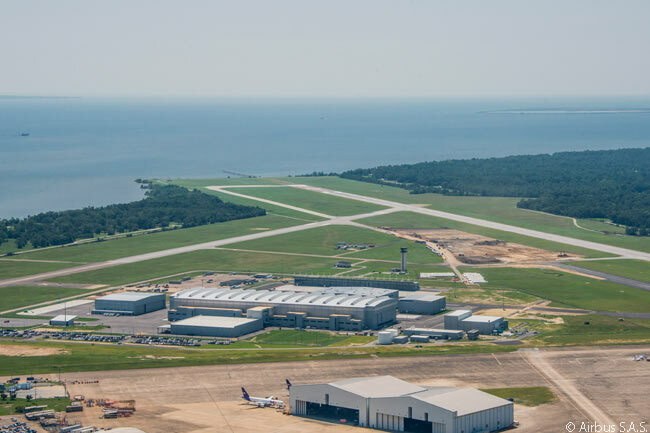 According to Zaremba, Airbus has negotiated the right to buy another 116-acre plot of land at Brookley, adjacent to its existing site. Airbus did so because it hopes eventually to increase its monthly production rate of A320-fmaily jets there to eight aircraft a month, or 100 maximum a year. Airbus expects the fact it is producing aircraft in the U.S. to provide “a similar bounce” to its U.S. sales that Japanese car manufacturers experienced when they started manufacturing cars there, according to Allan McArtor, Airbus Group, Inc.’s chairman and CEO. If McArtor is right, and Airbus’ sales of A320-family jets to U.S. customers rise well above 100 aircraft annually, then it appears likely that, even at an eight-aircraft monthly production rate, all Mobile production will still go to carriers in the United States.